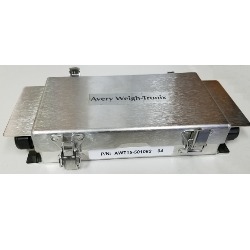 JBIT is a stainless steel NEMA 4X Junction Box from Avery Weigh-Tronix with either (4) or (6) internal weight sensor connections. It is available with dead load zero adjustment and each input has an adjustable precision span resistor for individual signal trimming. The JBIT is a stainless steel NEMA 4X junction box with four or six internal weight sensor connections available from Central Carolina Scale located in Sanford, North Carolina. It is available with dead load zero adjustment and each input has an adjustable precision span resistor for individual signal trimming. The overall height is 2.1" and the interface cable strain relief supports a .23" - .39" diameter cable. Both the four and six version weight sensor strain reliefs support a cable diameter from 0.19" to 0.36". Surge voltage protection is included.